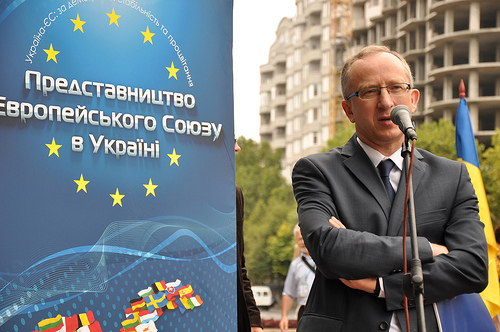 On September 12, the EU ambassador to Ukraine, Jan Tombiński, launched the EU Delegation’s new information campaign in Mykolaiv. In his conversation with the Mykolaiv public, Tombiński repeatedly stressed the importance of signing and implementing the EU-Ukraine Association Agreement. “Signature of the Association Agreement is a start of a start. Very hard work begins after the signature,” he said.“We are not only thinking about the signing of the Agreement, but we would like to make this agreement a roadmap and a working plan for Ukrainian reforms,” he added. Not only EU assistance, but also the work of Ukrainians is important for reforming the country. The street theatre show, “Europe on Your Street,” illustrated this idea with a vivid performance: the first in a series of information campaign events. In the play, the main characters came from Europe to visit their Ukrainian friend, who looked sad and tired. As true friends, the Europeans began to encourage their colleague from Ukraine, but despite their efforts, the Ukrainian friend remained unhappy. The actors then appealed to the Ukrainian citizens, the visitors of the event, for help. With the active participation of the audience, they succeeded in cheering up their Ukrainian friend. The actors performed in colorful costumes, creating a bright and vivid show. 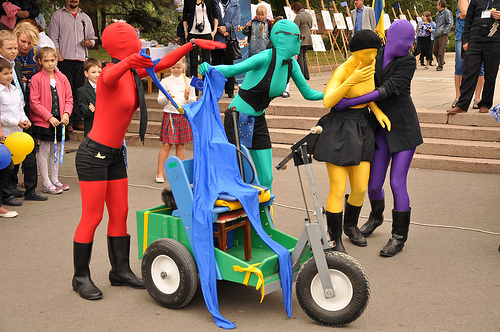 During this curious street theatre play, actors interacted with the audience, illustrating the idea that only cooperation of both the EU and Ukrainians can make Ukraine strong and independent. Using miming, gestures, and body movement, the actors created an eye-catching image of EU-Ukraine relations and Ukraine’s progress to European Union membership. “Ukraine has huge human potential,” Mårten Ehnberg, deputy head of the Swedish Diplomatic Mission to Ukraine, told citizens on the day of the launch. He noted that Swedish companies have shown significant interest in Ukrainian IT specialists. “You have smart and educated people. We are confident that if you have the political will, Ukraine will be able to perform all the necessary tasks. Therefore, we have a strong hope that the Association Agreement will be signed,” he said. Today, all European countries are going through a period of difficult transition. The Association Agreement will become a “national strategy for Ukrainian modernization,” ambassador Tombiński said. Its implementation won’t be easy, but it will bring tangible results. “You simply should not fear,” he added. The “Building Europe in Ukraine” Information campaign will involve a number of informative and educational events conducted during the year. The events are aimed at explaining the importance of the signature of the EU-Ukraine Association Agreement, spreading European values, and raising awareness about EU-Ukraine relations. The EU Delegation to Ukraine invites citizens interested in these issues to participate in information campaign events.